On these pages you will find information about Svalbard and what you should know before travelling here. Svalbard is a sustainable destination and before visiting you should familiarise yourself with Svalbard’s weather conditions, safety regulations and our Svalbard Guidelines for ensuring visitors act responsibly in the fragile Arctic landscape. Remember: In the town of Longyearbyen there is a tourist information centre providing all the information you need. 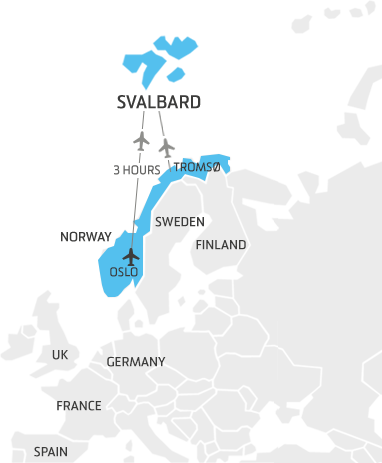 Please note that as Svalbard is outside of Schengen, you need a passport or national ID card when travelling here. History, geology, people, flora and fauna. Get the full story! Longyearbyen is one of Norway's sustainable destinations. All you need to know about travelling to and around in Svalbard. What is the best season to visit Svalbard? Choose between Polar Summer, Northern Lights Winter and Sunny Winter. Important information on how to be safe in Svalbard. We recommend you to read these important guidelines before coming to Svalbard. When visiting the High Arctic, you need to dress accordingly both summer and winter. Svalbard and Longyearbyen as a cruise destination. Important information for cruiselines.